Kodi brings a wide-ranging support to our entertainment world. 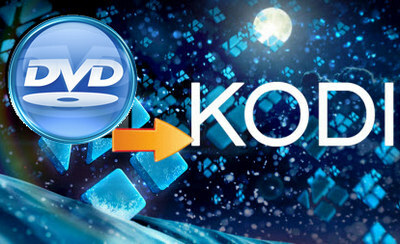 If you have no idea of how to play DVD movies in Kodi, this article will give you 2 solutions. Moreover, I will guide you how to rip your DVD collections for creating your Kodi DVD movies library. Now, free download recommended DVD ripper to get started. Kodi (formerly XBMC), is a perfect solution for creating a home media center that can stream multimedia from anywhere in the home or directly from the Internet using virtually any available protocol. Kodi is not just a good media server. In the eyes of CD/DVD disc enthusiasts, Kodi also has been able to rip audio CDs and playing DVDs with ease. Next, let’s go for how to watch DVD on Kodi and convert DVD to Kodi. With WonderFox DVD Ripper Pro, you can easily rip your DVD collections, besides, you can choose 300+ audio & video formats and devices as the output format. Easy to operate, fast to rip DVDS, customizable output parameters, you are worth trying this versatile software. How to Play DVD on Kodi? If you've got a DVD player hooked up to your Kodi machine and you want to watch your discs, please follow the steps below. Step 1: Insert DVD disc into DVD-ROM. Step 2: Launch Kodi and select the disc option in the Kodi sidebar. Step 3: Select Play disc and enjoy your DVD movie. Here is another way to play DVD in chapters on Kodi. Step 1: Insert the DVD disc into your PC's optical drive. Step 2: Click Movies on the interface and then click the movie name. Step 3: The DVD Video_TS folder will be listed here automatically, click it to load DVD chapters. Step 4: You can choose any chapter you like to play. Why and How Can We Rip Protected DVDs? However, although Kodi can stream media from DVD using a DVD-ROM drive, most DVDs are difficult to copy onto Kodi due to the protection of encryption technology. Therefore, if your physical disk is not supported or causes playback issues on Kodi, ripping DVD content is a good idea. Besides, you can transfer DVD to Kodi to create your own movie library. Then, how can we rip protected DVD? Firstly, an easy-to-use and powerful DVD ripper is a must. Here, WonderFox DVD Ripper Pro is strongly recommended. This is a popular DVD crack tool that can decrypt all kinds of DVD encryption technologies including DVD CSS, Region Code, Multi-angle, RCE, etc. Then, it can copy DVD to PC, tablet, iPhone and more devices. 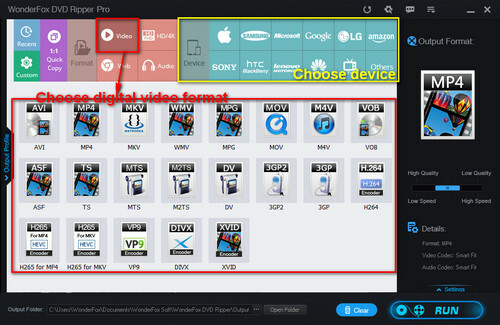 Of course, if you just want to rip DVD content to local, you can choose any digital video format to save DVD movie. Sounds complicated, is it? Don't worry, follow the tutorial below and you can convert DVD disc to digital video in three steps. Now, free downloadfree download this software to get started. WonderFox does not advocate any illegal exploitation of DVDs, please ensure that your actions are legal in your country. Preparation: Load your DVD into DVD-ROM and free downloadfree download Kodi DVD converter on your PC. As you can see, here are 3 options for loading DVD, for ripping DVD content, you need to click on DVD Disc icon to load DVD movie. 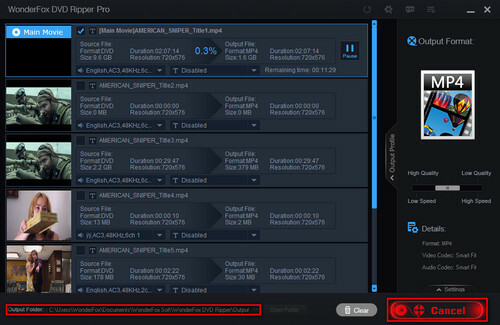 This software can automatically decrypt and rip the main movie after seconds. 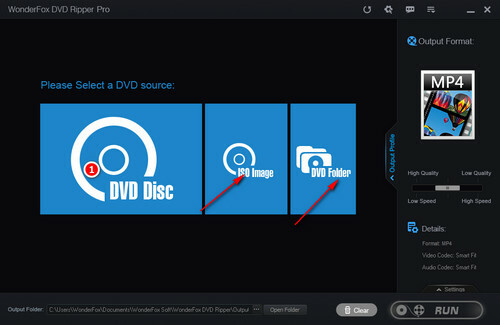 Tips: You are also allowed to rip DVD ISO movie and DVD folder with WonderFox DVD Ripper Pro. Now all you have to do is choose an output format for the DVD movie. Click Output Format section on the right side of the interface. 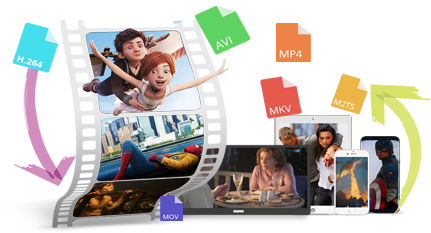 You can convert the DVD to digital video formats like DVD to MPG, DVD to MOV, etc. Of course, you can also directly convert DVD to your device, such as DVD to iPhone X, DVD to PSP, etc. To complete the above conversion, select the corresponding output format on the Video tab or Device tab. Finally, click on “Three points” icon on the bottom of the interface to set the output path for the ripped DVD movie, then click on the blue “RUN” button to start to convert DVD. You can see the progress of the conversion and the estimated time required. After the conversion, click Open button to find the output files. After ripping your DVD collections, you can create your own movie library in Kodi. Make sure that Kodi and other devices have access to the wireless network connection. Then simply copy, share and enjoy ripped DVD movies over the network with Kodi players or other portable devices from DLNA, Plex or NAS. At last, hope this article does help you and you can expect us more articles about Kodi or DVD! YouTube, Dailymotion, and other video sharing sites have provided us with many interesting videos, but unfortunately most sites don't offer direct download buttons. Therefore, we can use HD Video Converter Factory Pro, which is very reliable and easy to operate, to download the videos we are interested in. Try it out now!